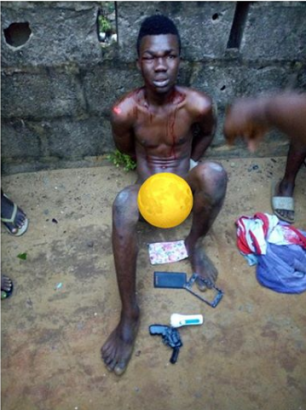 A thief who robbed lady of her phone and money at Afromedia estate, Okoko, Lagos with a toy gun, has been apprehended. The thief who robbed his victim, Juliet with a toy gun, was apprehended after his victim raised an alarm following the attack in her mom’s shop. Few months ago also, one Rilwan Wasiu was arrested by operatives of Rapid Response Squad, RRS, of the Lagos State Police Command for being in possession of a toy gun he allegedly confessed his gang members used to rob stranded motorists around Adeniji Adele end of the Third Mainland Bridge. Wasiu, who hail from Oyo State, was arrested last week Thursday, at Adeniji Adele under bridge around 10 p.m. during a scuffle with his girlfriend. The officers according to report sighted the suspect beating his girlfriend late at night by the road side. The officers stopped to mediate in the dispute when a toy gun fell off the body of the suspect. The suspect had attempted to run away immediately the toy gun fell off his body but he was promptly apprehended and taken to the RRS headquarters in Alausa, Ikeja Vanguard reported. However, on further interrogation, the suspect confessed that he is one of a 3–man robbery team specialized in dispossessing stranded motorists and passers-by of their belongings around Adeniji Adele end of Third Mainland Bridge. According to him, his two other gang members include; Salami and Sakiru and that they operated at night after working as bus conductors during the day. Commenting on the development, the Lagos State Command Police Public Relations Officer, Superintendent of Police, Chike Oti said that the deployment of more police officers by the Commissioner of Police to checkmate the activities of criminals on the Third Mainland Bridge had reduced crime in the area, adding that, officers are on the trail of other members of the gang.